There is a new addition to this blog. From time to time, I’m going to be writing a special post on Friday’s to highlight some new product or just whatever is on my mind. These will generally be smaller posts than normal and probably not be up to the research standards that I usually put into my other posts. The main point is to just quickly highlight something that amuses me that I would like to talk about that I can’t talk about in a regular post. This will not be a weekly thing but I will try to keep it on Friday’s as a little weekend prep. For anyone who doesn’t like food, you might have a few problems with it as I think I might be focusing more on food than anything else. Summer is winding down in Japan, to be honest it is still in full force, but the change to autumn advertising and products has already begun. I love the summer because there is so much to see and do and it all passes in a flash. This year I was excited about beer as Kirin produced a new gimmick. Asahi Super Dry has been working hard with their Super Dry Extra Cold which is beer that is chilled to be colder than normal. 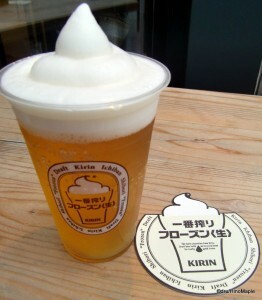 Good advertising, especially in the summer but Kirin one upped them and created Ichiban Shibori Frozen Draft. This is simply a beer with a slurpee on top. A slurpee is a semi-frozen drink that is often found in 7-11s and other convenience stores in North America. It is often called a slushy and has the consistency of a soft sherbet. The beer is poured into a mug and then they put the slurpee on top. The advertising says it keeps the beer cold for about 30 minutes as the slurpee acts as ice being a cool -5C. Drinking the beer can be a bit of a challenge. The reason for this is that the slurpee portion is not very good. It is okay but to drink or eat it is not special. You are better off using it as beer ice rather than something to eat. It can be a bit difficult to get past the slurpee portion but tipping your head back is one easy way to do it. By the time you do reach the bottom of the mug, the beer is still pretty cold and the slurpee portion is gone. Kirin has gone all out by building a temporary bar in Otemachi, Tokyo. Otemachi is the famous business district in Tokyo with lots of business men and many banks in the area. The bar itself has been so popular with its outside seating that they limit people to two drinks a night. The bar is always crowded and the plaza is boisterous. Unfortunately the bar will be closing after August 31 for reasons that are beyond me. Like everything in Japan, once a date is set, there is no turning back. September 1 is traditionally the start of autumn, but to be honest, with temperatures still in the low 30s or high 20s, it is really hard to think that summer is finished. Even the beaches are “closed” and people talk about going to the beach for the final time on the last weekend of August, and sometimes the first weekend of September. It is a shame as summer can last a lot longer. Be sure to try the Ichiban Shibori Frozen Draft while you can. 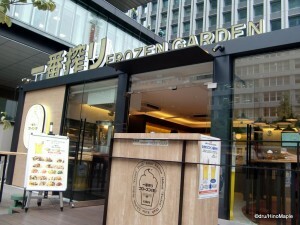 If you want to try it, you can visit the Otemachi Frozen Garden or go to the official website to find a restaurant with Ichiban Shibori Frozen Draft. This entry was posted in Food by Dru. Bookmark the permalink. Yes! Autumn advertising has begun! Our local konbini is selling oden! (@_@) Madness. Slurpee beer (cute name) is much more appropriate. Might do one next week on Autumn beer because it is out and I have a picture of it. 😀 However, feels too strange to do it. I have a few days to think about it though. Autumn beer when it’s 33 degrees? That’s cognitive dissonance. Brain disconnects. Doesn’t compute. Core meltdown. Curious to see it, though!